Barb Rocks Signs Frantic Romantic To Her Management Roster! Barb Rocks announced the signing of San Jose's dreampop rockers Frantic Romantic to her management roster. Having worked with the band in their previous incarnation, as well as managing lead singer Mr. Kerosene's former band Drop Dead Sixty, it was only natural for Frantic Romantic to sign with the local band manager they already trusted and built repertoire with. Frantic Romantic emerged from the ashes of Skyway View with an arsenal of new music, which they've been releasing monthly since October 2018. Comprised of six strangers who came together to handcraft a sonic, melodic miasma of songs, they’ve been compared to the likes of The Cure, Echo and the Bunnymen, and Psychedelic Furs. Both melodic and aggressive, they possess a sound sonically reminiscent of decades past, oozing 80’s new wave mixed with 90’s culture, with a stage presence to match. With four singles and accompanying videos released already, plus a new video and full EP coming this Spring, the band is ready to burst out of California music scene and gain traction wherever they can. In regards to working together, Frantic Romantic's Mr. Kerosene said, "We’re very excited to announce our official partnership with Barb Rocks. Barb has a quality that few others possess: she really gives a damn. She wants musicians to succeed, and she’ll fight for bands even when they aren’t fighting for themselves. As a group, we feel our dedication to our work will not only be matched, but heightened by her services. She has a myriad of resources and she makes herself constantly available. We look forward to working with our manager and close friend, Barb Rocks." Both Frantic Romantic and Barb Rocks are excited for this union and what the future holds, confident their working relationship will lead to prosperous years ahead. Be sure to check out all the creative music videos Frantic Romantic has released in the last four months and be sure subscribe to their YouTube Channel! The band is currently shooting their new music video which they plan to release in March, followed by the release of their debut LP Celestina. And don’t forget to stream their music on Spotify! Planet Booty + Barb Rocks = Bootylicious Team! Citabria Inked Management Deal with Nemesis Media Inc. Alternative rock four piece Citabria has just inked a management deal with Nemesis Media Inc. Their groovy rhythmic rock has been a hit at home in Northern California, as well as gaining popularity on the international market, including a performance in Açor Talentos, Portugal’s version of American Idol. Citabria recorded their most recent full length album Exit Reality at Jingletown Recording, famous for being owned by Green Day, which garnered some radio airplay and rave reviews. The band most recently played Santa Cruz Music Festival, supported legendary Campbell band Strata at prestigious concert venue The Ritz, and graced the stage at San Jose’s premiere Rockbar Theater. With roots in San Jose and Austin, Nemesis Media has become known for producing high quality events and for their continued support of Balanced Breakfast, the music industry networking group. 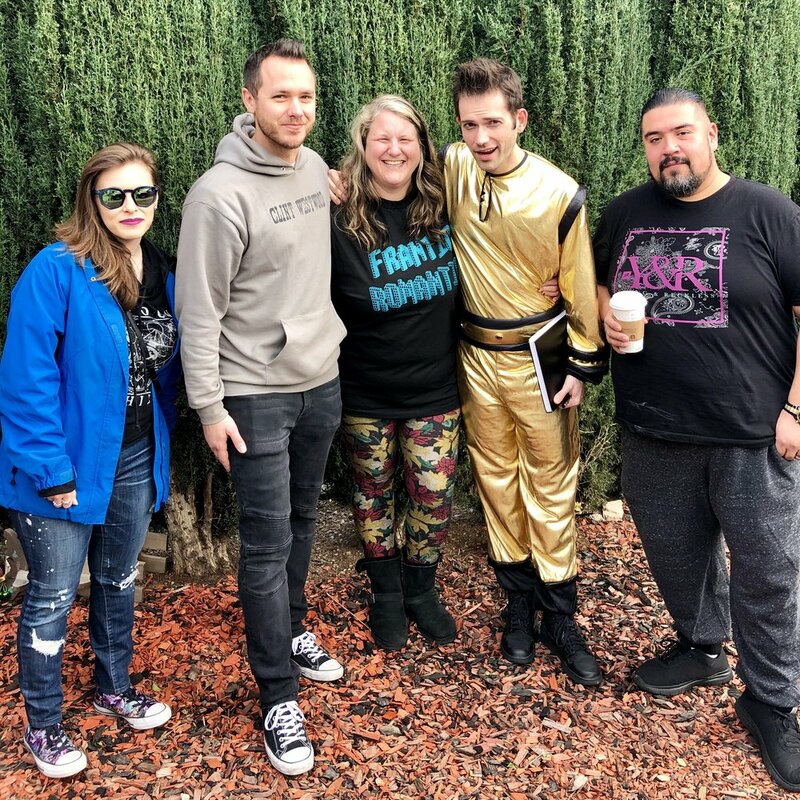 Nemesis Media recently signed a number of great regional acts from the San Francisco Bay Area after joining forces with fellow promoter and talent manager Barb Rocks. Nemesis Media VP of Artists and Repertoire Barbara Wahli said of Citabria, "Having been a fan of Citabria's music for 7 years, I knew I wanted to work with this incredibly talented band for some time, especially when I heard their newest album "Exit Reality"! Nemesis Media is lucky to work with such a technically-savvy band that has a modern and mainstream edge, whose sound grabs a hold of the listener and doesn't let go. Each band member's integrity and love for what they are doing shines through their songs and live performances, which is refreshing in the music business." Asked what their thoughts were, Citabria as a whole said "Citabria is stoked to be partnering with Barbara Wahli & Nemesis Media. We feel very positive and unified knowing that they will guide us on this path of progress. They are exceptionally knowledgeable and it gives us a sense of relief knowing they got our backs." Both Citabria and Nemesis Media are excited for this union and what the future holds, confident that strategic business partnerships like this will lead to prosperous journeys ahead. For all things Citabria and Nemesis, check out nemesismediainc.com, or like the band on Facebook. Citabria is releasing a bunch of new songs and videos in 2016, as well as a monthly touring schedule, so stay tuned for details on their social media! Nemesis Media Welcomes Sit Kitty Sit to their Management Roster! Nemesis Media Inc. announced the signing of San Francisco hard piano rock duo Sit Kitty Sit. Without a string in sight, the band consists of Kat Downs on keys and pipes, while Mike Thompson sets the stage with his percussion. Sit Kitty Sit possess a mind blowing sound that engulfs the audience with expert keystrokes and a powerful, driving drum beat, accomplishing more as two people than a full band on stage. None of which is surprising considering the musical tutelage of both band members, whose backgrounds and experiences have lead to some admirable accomplishments. Sit Kitty Sit are incredibly busy touring Europe right now and have many shows coming right around the corner! Keep an eye out for any and all news at their website, sitkittysit.com. For more on Nemesis Media Inc., check out nemesismediainc.com. Nemesis Media Inc. announced today the signing of The Go Ahead from San Francisco, CA. The Go Ahead feature a soulful and rhythmic sound, with the wonderfully melodic vocalist Kyna Wise providing a serene singing style. Alex Mamelok on bass and backup vocals, Josh Hertz on guitar and backup vocals, as well as Chris Kelly on drums, round out a dynamic four piece that reminds of what great music San Francisco has to offer. The Go Ahead recently remastered their self-released "Cycles" EP and are about the release 3 music videos in the up-coming months. The Go Ahead said of Nemesis Media, "Barbara has a true passion and love for finding great music. We are excited to be working with Barbara and the rest of the Nemesis team because we truly feel that they can push our music to new heights and help us share our music with a wider fan base. Managing multiple bands is more than a job for Barbara, she is a music lover and enthusiast at heart. We are honored to be added to the Nemesis roster and to have the opportunity to further build our relationship with Barbara." Nemesis Media’s own Barbara Wahli said, "The Go Ahead caught my attention instantly with their high energy sound, mixing a variety of genres together, with the added bonus of sultry and soulful female vocals. It's always a pleasure to work with a talented band that's not only proficient in their art, but also knows how to give that little bit extra to captivate the audience and leave them wanting more. Nemesis Media is excited about The Go Ahead's future as they continue to amaze audiences with their powerful hooks and formidable rock sound that's bound to get everyone dancing." Barb Rocks Management Roster Picked Up The Go Ahead! I am happy to announce that The Go Ahead from San Francisco are now part of my management roster! This talented, high-energy bluesy-rock four piece is known for their incredibly unique sound, pulling from influences such as Incubus, Red Hot Chili Peppers, Primus, Fiona Apple and many more. They're a nice blend of powerhouse grooves, soul-shaking bass, jaw-dropping guitar lines, and melodies packed with sheer emotion, which makes this band an experience unlike any other. Vocalist Kyna Wise is an excellent front-woman that really pulls the audience in with her "barefood" performance. I first met The Go Ahead when they were known as Jesús and the Rabbis and they played Woodstock's Pizza stage at the debut Santa Cruz Music Festival. They played right after Pounders, ending the night with a lovely soulful energy. A year later, with a new band name, I ran into them again when they played with Fritz Montana, which turned out to be a wonderful reconnect leading to some awesome show collaborations between the two bands. I've really gotten to know the band over the past year, bonding even more this past March in Austin at SXSW. I know this collaboration which will lead to some promising things and am excited for our future endeavors together. Please welcome The Go Ahead to the Barb Rocks family! New Indie Blues Band Fritz Montana Signed With Barb Rocks! Formed in early 2013, new blues/indie rock trio Fritz Montana have already been making waves and getting noticed by industry folks. Due to a connection through a photography friend, the band met Kirk Harding from Crowd Control Management, manager of The Neighborhood and Little Daylight, who was very impressed with their sound and gave them some guidance on what his label is looking for. The band is a cross between The Black Keys and The Strokes, with a noticeable Jack White feel in the vocals; some even throw Atlas Genius in the mix. I'm truly excited to be working with Fritz Montana and feel this young band has a lot of potential to make it big. Live 105 Music Director Aaron Axelsen debut their song "Say It So" last Sunday on Soundcheck and received a lot of texts from listeners diggin' it. Fritz Montana is currently in 4th place in Live 105's Favorite Local Band Poll! I encourage you to check them out and see what everyone's talking about. Plus they're playing The Blank Club on Friday, November 1st, with Kiwi Time and All City Elite, which is a great time to see their live set! Power-Pop Sister Duo The Trash*Pop Icons Partner With Barb Rocks! In my first few years putting on Barb Rocks shows, I had the wonderful pleasure of meeting Letters Make Words, a pop rock band featuring the Zep sisters. We instantly bonded and they trusted the 'less experienced' me to manage for a few years with the additional help of A Kid At Heart Management. We had some good times together, learned a lot about the local music scene, and had a nice stint of shows, radio play, press, etc., plus the sisters won 2nd and 3rd place in the Your Music Magazine San Jose Olympicks vocalist contest. Let's just say a lot has changed since then.....for the better! These lovely sisters rebranded themselves under a new band name, The Trash*Pop Icons, found a label to record an amazing album (which they released on my birthday July 2 a month ago), and now they are ready to take over the world, with the help of the 'more experienced' me, and it's starting right here in the Bay Area! I highly encourage you to download their debut record "A Way With Words" on iTunes, which features my favorite song "The Shame," as well as the hits "Love/Hate," "Stupid Love" and "Screaming Your Name." You can also stream the album on Spotify and check out the songs on SoundCloud. The Trash Pop Icons are sisters Naomi and Nadia Zep. This power-pop duo have been making music together for over a decade and have established quite a presence in the San Francisco Bay Area. When fronting their previous band, Letters Make Words, the sisters earned themselves a spot on the Vans Warped Tour, playing the Kevin Say Stage and were named one of the Top 10 Bands in the Bay Area multiple times by local DJ Aaron Axelson of Live105 radio. In addition, they won the first annual Whole Foods Market and VH1 'Raw and Unprocessed' Team Member Music Project last year, which gave them the opportunity to play Live In The Vineyard music festival in Napa Valley. The girls are proud to release their first full length album "A Way With Words" and are looking forward to touring to support their record. Live105 NSSN Local Band Winners Our Vinyl Vows Added To Barb Rocks Management Roster! Our Vinyl Vows thrive off making personal connections with people and defying general classifications by blending elements of surf rock, stand up comedy, indie rock, R&B, dance pop, and funk. A culmination of experienced musicians, Our Vinyl Vows, which consists of Brandon Hall (lead vox), Nick Kopan (lead guitar/vox), Colin Goheen (bass/vox), Mat Fleisch (keys/sax), Eric Peters II (brass/vox), and Nick McNair (drums), have spent a good deal of time honing their craft, figuring out what really gets a crowd moving. Packed with danceable anthems and high energy, Our Vinyl Vows are known for their live shows, making that direct connection with each audience member that resonates deep in the soul. Their passion for the stage and strong work ethic have landed them spots to play with national acts, as well as ruling the airwaves; two of their songs have been retired after receiving 20 weeks as the number 1 most requested band on 101.7 The Fox. OVV also won the Live105 NSSN Local Band Contest in 2012, which led to them opening for Jack White, The Shins, Metric, Of Monsters And Men, Gaslight Anthem, and Two Door Cinema Club! It will be my pleasure to work with such a talented band that's already close to my heart, and I look forward to big things together! I highly recommend you check out their debut album "You, Me and Einstein," produced and mixed by the famed bay area producer, Scott Llamas. Santa Cruz Artist Stormy Strong Signed to Barb Rocks Management! It gives me great joy to announce that Santa Cruz artist Stormy Strong has signed management deal with me! Stormy is a very talented singer/songwriter that has won three songwriting contests for his song "Save You" from Billboard World Songwriting Contest, Great American Songwriting Contest, and Disc Maker's Indie Music World Series, plus his song "Sail Away" won The Best Music You Have Never Heard on KGO Radio in 2007. Stormy's song "Jumpstart The Heart" was chosen as #1 in "Rick's Picks 2012" on 'The Best Radio You Have Never Heard' podcast, which also included songs from Smashing Pumpkins, Regina Spektor, Arcade Fire, Rage Against The Machine! Stormy's unique cover of The Pixies "Where is My Mind?" has been popular on iTunes, Spotify, Rdio, Mog, and iHeart Radio. It's also the song that originally caught my attention 6 years ago when I first booked Stormy at the Cupertino Brit! His new EP "Take Her Down" was recorded with music industry icons Lyle Workman (Frank Black, Todd Rundgren, Beck), Sean Beavan (Guns N' Roses, Marilyn Manson, Nine Inch Nails), Tim Narducci (Systematic) and Chris Manning (Jellyfish). Since 1996, Stormy Strong’s brand of "alternative saltwater rock"sinks in with razor sharp hooks, honest bitter lyrics and raw emotion, biting with an unforgettably addictive sting. All City Elite added to Barb Rocks growing Management Roster! I'm happy to announce San Jose's very own All City Elite has decided to work with me as their band manager! All City Elite, A.C.E.s as it is commonly referred to, is a collaboration between various Bay Area recording artists and musicians who were looking to create an exciting new sound, with broad appeal, but without being confined by specific genre trappings. This, along with an energetic stage performance and a strong focus on the digital distribution of their media, has already led to an impressive fan turn out and overwhelming support from friends, family, and colleagues alike. Having known Rob Hurtado for years through the Jade of Days friend circuit, I was excited to see him perform with ACE last year when they opened for Filter; a very high-energy show that Pounders were also a part of. This Saturday will be ACE's first time playing a Barb Rocks show and I'm stoked to see this lively band in action once more! In the process of booking ACE for the show, we started chatting about their management needs and it turns out, they were looking for a local manager that could help them get more shows, press coverage, radio airplay, and overall better exposure in Silicon Valley and beyond. Considering I specialize in just that, mostly in the local market, and am a fan of their music, we found that we were a perfect fit to work together. I'm very excited for this new endeavor and look forward to working with such a musically talented group! Help me welcome All City Elite to the growing Barb Rocks "Empire"! Barb Rocks growing her management roster with South Bay's very own Chris Ely! Chris Ely first contacted me in June (2012), referred by the talented Dewey Rogge, and I could tell by our first phone conversation that we would get along well and do great things together. There was just something natural and easy about our conversation, two like-minded people that love music and just want to share that passion with the world. It took five months to finally get Chris and his band on one of my shows, but I knew in my gut that it would be a good show and that it would lead to a solid business relationship. His song "Lost Souls" moved me the first time I heard it, and to this day, I'm still smitten by that song. Today, I'm happy to announce that Chris and his band have decided to work with me as their manager, and I look forward to our journey together! I encourage you all to check out Chris and his band at their next show, Wednesday, November 28th at The Blank Club, playing with Drop Dead Sixty and Cosmic Machine (21+ FREE show)! Chris Ely's band consists of Gus Fjelstrom (bass), Nick Grant (drums), and Nick Tresko (guitar/keys). Chris and I both feel that they need to come up with a name that suits them, so if you have any suggestions, let's hear 'em! Chris Ely & The ___________? Chris Ely began his musical journey in the San Francisco rock scene. Originally a bassist, he first picked up a microphone when he was elected to sing in a newly formed band. Overcoming his shyness, he learned to embrace the role of lead singer. A year later, Chris seized an opportunity that led him to move to Africa in 2001. As a songwriter, his music took new shape and purpose. He was forever changed from witnessing the immense poverty and plight of those suffering from HIV/AIDS. After eight years oversees, he could no longer neglect his passion for music and songwriting. Since the prospects of the music scene in Africa were murky at best, Chris decided to return home to California. In the Fall of 2009, he took a job as a high school teacher. He utilized his first summer off by crafting a fresh sound while crammed into a new apartment. But before embarking on a solo project, he played in two bands, as well as offering his talents as a bassist to a local hip-hop artist. Eventually, at the repeated request of friends, he began work on a solo project. As Chris fine tuned his new sounds, a story began to unfold in the songs while he grappled with American culture and the life he had recently left behind. These songs became a diary of his recent journey called "Can’t Stay for Long." Between the edgy rock riffs and atmospheric synthesizers, something honest and refreshing emerges in "Can’t Stay for Long." Chris has a way of mending tense and complicated moments with his soothing voice. Coupled with a distaste for politics and the ache of broken relationships, his vulnerable lyrics invoke optimism in the human soul. I am now managing San Jose darlings POUNDERS! I'm sure many of you already know who the Pounders are since they've been leaving quite an impression throughout the Bay Area when they perform, but for those of you who haven't discovered them yet, it's about time you get DOWN TO POUND! Imagine Billy Joe Armstrong (Green Day) with Travis Barker (Blink-182) laying the foundation of the music, mix in some heavy Les Claypool (Primus) influenced grooves of a self-proclaimed "Bass God," and you have the wonderful formula that makes up Pounders. This trio literally owns the stage with their electrifying stage antics, creating buzz each time they perform, leaving audiences longing for more. With the release of their new album Chasing The Sun in Winter 2010, Pounders are eager to get their music out to the masses. In the upcoming weeks the band will be working with San Jose filmmaker Frank Door and his company Element 151 on a music video for the album's namesake single, as well as opening a new all-ages venue in Los Gatos to appease the younger audience and grow the local music scene. Pounders have already had the honor of playing Vans Warped Tour in 2008, the "Bring It Back Tour" stage at Left Coast Live in 2009, the Morgan Hill Friday Night Music Series and Wine Festival, Santana Row Music Series, the Whiskey A Go-Go in LA, and various Hot Topic stores throughout California, plus they shared the stage with Mike Herrera of MxPx at their own CD Release show. With even bigger things are in the works, everyone will soon be DOWN TO POUND! I am managing East Bay band Drop Dead Sixty! For those lucky enough to be at my August 21st show, you were in for a treat! It was the first time Drop Dead Sixty performed on a Barb Rocks show and they were AMAZING! Imagine Stone Temple Pilots meets Muse with a theatrical front-man with vocal styling similar to Michael Hutchence (INXS) that even Scott Weiland would appreciate! I was so impressed with this band that I asked to work with them, and they happily accepted my management offer this past weekend. Drop Dead Sixty is comprised of guitarist/keyboardist Gavin Billy Cougar, vocalist Michael Kerosene, bassist/backup vocalist Joe Dalva, and percussionist Matt Young. After a four-year-long stint in high school with a band called Calibur, life-long friends Mike and Gavin decided to reunite musically and start something new, which was the beginning of Drop Dead Sixty in January of 2009. Having played a couple of shows with (in separate bands), and keeping in touch with Matt Young, he was the first choice and immediately recruited as the drummer for the new project, along with Mike's brother, Matt, who would fulfill the role of bass guitarist. By the end of 2009, Mike's brother parted ways with the project and soon Joe Dalva answered an ad to try out for the band. With the newly recruited Joe Dalva, Drop Dead Sixty was again ready to move forward, first by re-emerging as a live act in April 2010, then announcing a new full-length album, due out by Winter 2010. Barb Rocks is now working with Cadent! Barb Rocks is proud to announce that she is now working with Cadent, an up-and-coming female-fronted Bay Area band. Cadent features a wonderful blend of rock, pop, alternative base with a touch of R&B vocals that makes them a force to reckon with! With such few female-fronted bands in Northern California, it's refreshing to hear such a mature sound out of the "younger" band with power-house vocals that touch your soul. Currently recording at Castle Ultimate Studios, the band has already released three of their tracks, with plans to release a full album soon. Plus Cadent just placed 3rd in the San Jose edition of Your Music Olympicks after being selected "Editor's Choice" by Your Music Magazine. It is my pleasure to work with such a diverse band that I feel will take the local scene by storm, with hopes they might just be the next Paramore! © 2006-2019 Barb Rocks. All Rights Reserved.